Two piece sets ensure a perfect joint! Voted "Best Cut" in Fine Woodworking #107! These carbide tipped cutters come as a matched 2 bit set so that the rail and stile match precisely. They cut a 1/4" thick x 3/8" deep tongue on 3/4" stock. Mission Style Set #8846 cuts a 5.2mm high by 3/8" deep slot for plywood panels. For a stock thickness of 3/4". Regular Price $84.95. 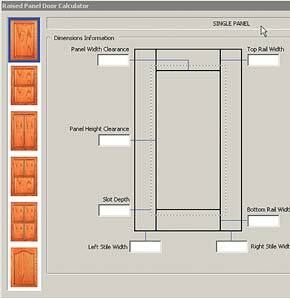 Raised Panel Door Instructional Video. Raised Panel Spaceball keep panels perfectly centered! Save time, effort and wood. 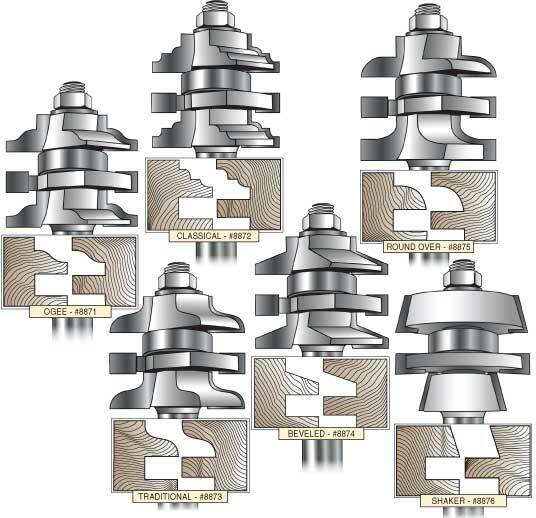 The pre-cut profiles allow quick, proper height adjustments with accurate setup everytime. Made of 2-3/4" L x 1-7/8" W ultra high molecular weight polymer and will not distort or swell. For 3/4" stock only. Instructions included. I have been making cabinets for over 25 years and have been using MLCS bits for most of that time. I fins that the bits are always good quality and their prices will beat anyone else. I highly recommend them to anyone who is looking for good bits at a great price. I have been a customer of MLCS since the early 80's and I am still using some of the bits I bought back then. I have 3 different sets of the rail and stile bits and they have never let me down. I have recommended MLCS to all of my woodworking friends and will continue to use them. They are the best bit for the cost. I have owned a stacked rail & Stile stacked bit for about a year, but only used it recently. After a few test pices I saved the perfect pices for setups. I have now used the bit w/a router lift to mill maple, cherry and beach - what a pleasure. No bit changing - quick set up clean profiles. I built shop made sled that accmodates a backup to avoid tearout. As long as you mill your stock properly your doors will be perfect. Voted "Best Cut" Fine Woodworking 107! 2 flute, carbide tipped with totally enclosed ball bearing guide. The easy way to make perfect rails and stiles with only one router bit. Cut rails and stiles without having to reverse, switch or reassemble cutters, or without having to remove the bit from your router. All that is required is to simply lower or raise the bit. For best results use only with your router mounted in a table. For FREE instructions, click link below. For cutting a 5.2mm tongue for a plywood panel see our Conversion Kit for European Plywood. I have been using MLCS router bits for many years and recently purchased my first stacked bit for making raised panel doors. This is a great idea and I wish that they had all their profiles in this product. I love them, no stopping to restack the bit or change the bit. Just change the height and continue cutting. A great time saver. In spite of what is shown in the video, when you make the first cut with the top part of the bit, the lower cutter is high enough to cut into the base of the sled. This removes the edge that rides against the fence and next time you go to cut another end cut, the edge of the sled is cut away and the sled rocks against the fence. Basically it ruined the sled. to overcome this I cut a piece of 1/4" masonite to fit on top of the sled base and put a slot to match the one in the base that the handle slides in to thighten the block against the stock. Since the sled edge was already cut away, this scarificial piece has the edge cut away by the lower cutter of the bit and I can throw it away when I am done making the end cuts. You still have to make sure the sled does not rock as you slide it along the fence because the edge is still being cut away by the lower cutter. Save $20 on all Reversible Combination bits! 2 flute, Carbide Tipped with totally enclosed ball bearing guide. 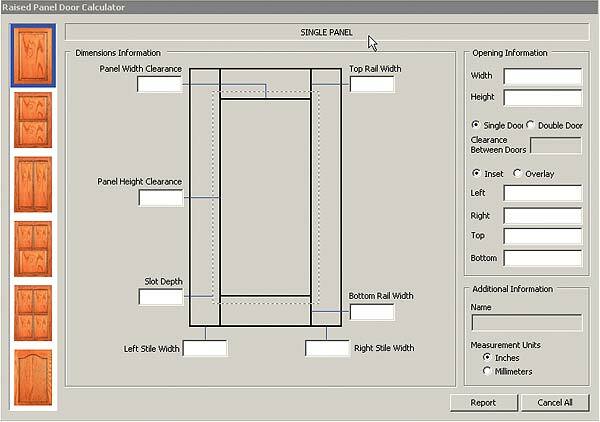 For making matching rails and stiles in raised panel doors, etc. works with stock from 11/16" to 7/8" thick. For stock over 7/8" thick, simply rabbet out the bottom of the rail end. Cuts a 1/4" slot for the door panel. If you need a Rail & Stile/Raised Panel bit set, check out our Mix & Match Raised Panel Sets HERE, for savings up to $35! Additional "Traditional" profile cutter. The perfect rail and style bits when used with MLCS' setup blocks. I made 22 kitchen cabinet doors with these bit and used a flat plywood oak laminate for the center panel. I never made doors before but found these bits make everything so much easier. I would use no other bits but stacked bits again. They are worth every penny. Truly a great product. Don't hesitate to buy you will enjoy them. I've owned the 6545x series for a number of years and have had excellent results. Speed is a must watch with this series with the 1/4 inch shaft which could lead to disaster and possibly severe bodily injury. I highly recommend going to the 1/2 inch series for the above reason but if care is taken, the 1/4's will serve you well. Additional Profile Cutter on Sale! This traditional profile cutter allows you to make a traditional inside edge detail. SALE! By popular demand! The special slot cutter replaces the existing slot cutter in any MLCS Reversible Rail and Stile bits or MLCS Stacked Rail and Stile bits and creates a 5.2 mm wide panel groove that accommodates the commonly available European Plywood. Shims and washers are included. I ordered this along with the stacked Shaker Rail and Stile Bit. I wondered, with this thinner slot cutter, if the rail "tongue" would then be too wide to fit into the slot. These clever engineers recessed the mating surfaces of the slot cutter to accept the bearing and lower cutter. Using the amply supplied shims, I achieved a fantastic joint. The 5mm panels (more and more common) fit the 5.2mm groove perfectly! I couldn't be more thrilled with this product and highly recommend it!